This post brought to you by the power of sheer determination. Since we last spoke I have put the finishing touches on two small yet unbelievably demanding manuscripts, sorted through 40+ years worth of Consumer Reports magazines and then threw them in a dumpster, packed up my family home, moved my mom from the comfortable environs of Minneapolis *sniff* to the unfamiliar wilds of Central PA. (where, just to review, they serve French fries on salads, address you if you're more than one as yinz, eat large quantities of scrapple as if it's an accepted social practice and ask you if your car needs fixed. Somewhat of a hard sell at times, I know, but the place does have its charms). Whew! Mods: I knit the middle size for the stockinette portion and then did 3 lace repeats. This made for a nice, medium size wrap. This pattern was a true joy to work on. First and foremost I love that the pattern is flexible enough to allow you to size as you see fit--I played it safe and shot my arrow straight down the middle and did three repeats. Bull's eye! 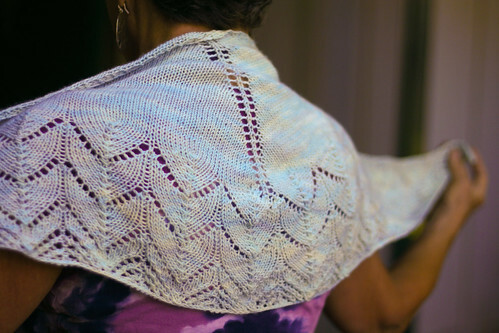 The shawl was not too big, not too small (because GOD how I hate a too small shawl). 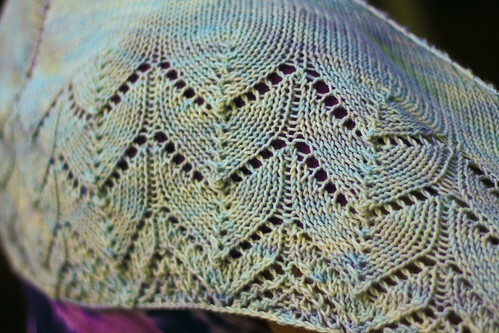 The lace pattern and border are also intuitive as all get out and completely easy to follow. Lastly I am loving this pattern because I made it for one of my oldest friends on the books. Elizabeth and I shared a cradle together! We had every holiday together from the 70s to the 00s! Our parents were 60s people together and sometime in the 70s we almost all moved in together commune-style (yeah, SO relieved that one never happened because, hello, how do you explain that particular freak flag at your Episcopal day school?)! And we have remained good friends, so it was a joy to be able to attend her wedding on our last day ever in Mpls *sniff* and welcome her husband into the fold. 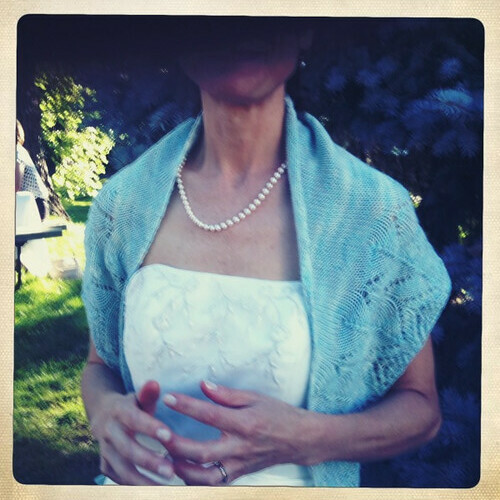 I gave this shawl to her at the reception and there was just enough of a nip in the air to make it appropriate. The shimmery light blue of the STR sort of screams 'summer special occasion', if that is possible. All told, this pattern was a breeze to make and a joy to give away. Thank you so much for the deluge of nice comments and sweet messages you have been leaving me over the summer--I have read each one with gratitude and delight. We sort of have a special thing going on here, this whole fiber community thing, right? Knitters FTW!